The Columbus Craft Beer Festival is back, Saturday May 18, at Mill Race Park. Join WKKG and sample craft beer from over 40 different breweries in Indiana. Unlimited samples from 2 – 6 pm, or upgrade your ticket to the early bird or VIP pass to start tasting at 1pm! For the friends that want to have a great time with you but still get home safe, there are discounted “DD” tickets for them too! If you’d rather save your money and go for free, (WHO WOULDN’T?!) 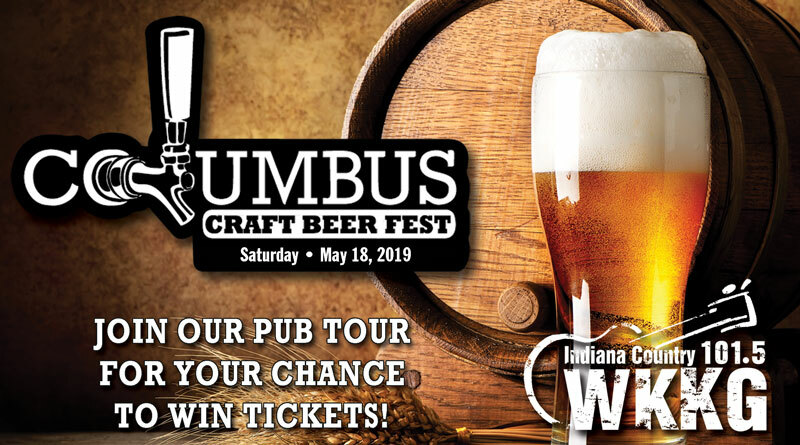 then stop by one of the 2019 Pub Tour Stops for a chance to win a free pair of tickets from the Columbus Craft Beer Fest and particpating Pub Tour Sponsor. Kelsey and Cody will be there to hand out free WKKG swag! Proceeds from this 21 AND OVER event benefit local organizations like The Columbus Park Foundation, Turning Point Domestic Violence Services, and Just Friends Adult Day Services. For 15% off your tickets!